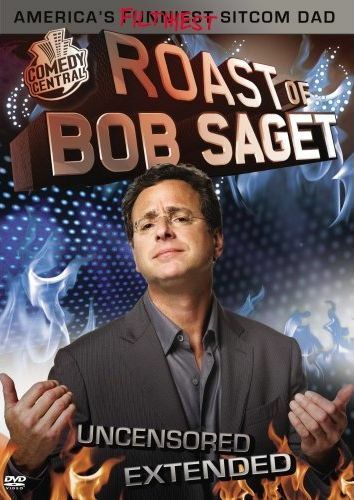 The Comedy Central Roast of Bob Saget... yep, America's clean cut family man from Full House and America's Funniest Home Videos . Of course, anyone who happened to see The Aristocrats would know what kind of mouth this guy has on him, so I was really looking forward to this one. I've seen several of these Comedy Central Roasts on television, and have been shocked that they can choose to not censor the shows, because there is a whole lot of swearing in these things. Even so, I'm sure most are edited for time, so for this installment I decided to go the DVD route. And I'm glad I did, because this was a good one. The roastmaster (or host) for the event was none other than Saget's costar on his famous family sitcom show Full House, John Stamos. Stamos did a good job at flinging insults and getting everyone warmed up for the filth to follow (that's how these roasts work, in case you've lived in a cave for the past decade). And let me tell you, there was a lot of filth! Jon Lovitz, Gilbert Gottfried, Greg Giraldo, Norm Macdonald, and a bunch of others all got their time in the spotlight to bring down Mr. Saget and whoever else just happened to around. Many comedians touched on the same subjects for their jokes, but the jokes themselves which each were unique and most hit the funny bone. By far the standout of the night was Cloris Leachman. Many a comedian did jokes about her before she stepped up to the podium, but she showed them all what real trash talking was all about. She let everyone have it and everyone in stitches. On the other side of the spectrum was Norm Macdonald, who had everyone dead silent. I mean, you could hear a pin drop during his set. Was it really that bad? Yes... and no. Norm did a bunch of really lame, very old jokes and did them with a completely deadpan delivery. This made them completely not-funny... but surprise,that was the point! It was like anti-comedy, which leaves people baffled until the sets over, at which point you just can't help but crack up at the absurdity you just witnessed. Genius or insanity? You decide! After each roaster had his or her turn at the podium, Mr. Saget finally had his chance to stand up and say a few words... and he showed that he can give as good as he gets. He doesn't get as nasty as in The Aristocrats, but this definitely isn't the same persona that hosted America's Funniest Home Videos. I'd say it's worth watching. The DVD, besides being completely uncensored and longer than the televised version, also has some extra features, but none that make the DVD anything great. There is a really short behind the scenes thing which is just some of the people attending the event doing some pre-roasting. There is also something called Bob Saget Interviews, but it's not really interviews, just short clips of him giving various punchlines... feels more like promo material for the show more than anything else. After the Roast shows us various short interviews with some of the people after the roast has concluded... it's one of the longer extra features on the disc, clocking in at somewhere around under five minutes. And finally, there is On the Blue Carpet, which is like those red carpet events before the show where everyone attending talks briefly to the cameras (or actually the interviewer dude behind the camera). None of the extras really add to the DVD, but the show itself was enjoyable. I'd recommend renting this one.